The QPP proposed rule for 2019 performance year was released on Jul 12, 2018. It brings in a host of changes. We will explore the proposed rule in this multi-part blog series and highlight the changes. In Part-I of the series, we will discuss the overall impact of the proposed changes including the influence of the Bipartisan Budget Act on the MIPS eligibility requirements and payment adjustments. Let's dive right into it. Optional Opt-In Not Available Clinicians who meet or exceed at least one of the three Low Volume Threshold criterion will be able to opt-in to participate in MIPS and be subject to MIPS payment adjustment. Submission type Only one submission method per performance category allowed For the Quality performance category, individual eligible clinicians could submit a single measure via multiple collection types (eCQMs, MIPS CQMs, QCDR measures, Medicare Part B Claims measures) and be scored only on the data submission with the greatest number of measure achievement points. Groups have the option to submit data for the Quality performance category via multiple applicable collection types. This flexibility is not applicable to the groups that utilize CMS Web Interface. High Priority Bonus End-to-End Reporting Bonus and Complex Patient Bonus remains the same. 2015 Certified EHR Bonus for PI category no longer available as 2015 CEHRT is a requirement in 2019. 2014 CEHRT will not be allowed. High Priority Bonus has been removed for CMS Web Interface reporters. Will receive 3 points even if data completeness falls below 60% for a quality measure for measures that do have a benchmark and meet the case minimum requirement. The other clinicians will receive only 1 point. Medicare Part B Claims will be available to Small Practice Groups (1-15 eligible clinicians) for submitting MIPS data. Small Practice Bonus moved to the Quality Performance Category. 3 points added to the numerator while calculating the Quality performance category score. Facility Based Scoring Not Available Available to the facility-based MIPS eligible clinicians and groups for both Quality and Cost performance categories. The 2019 measure set for Hospital Value-Based Purchasing (VBP) program will be used for scoring. 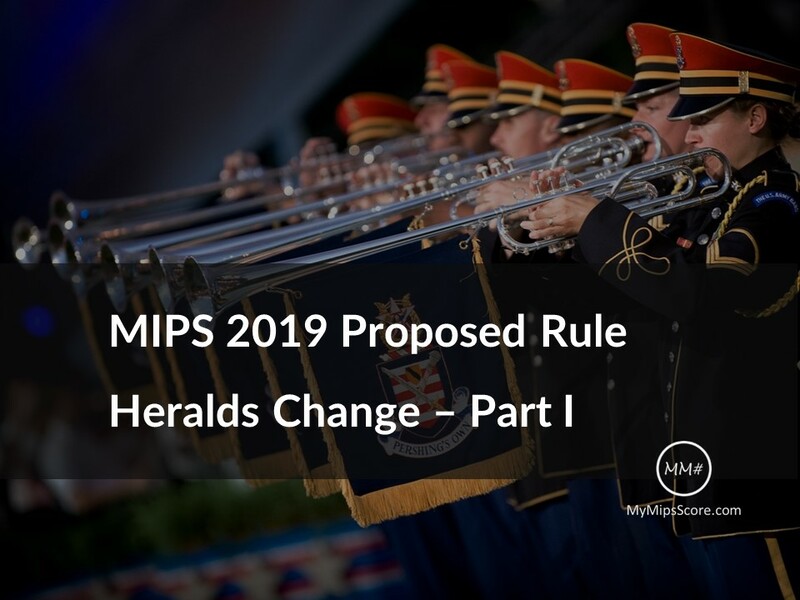 The Bipartisan Budget Act which was released on Feb 9, 2018 lead to changes to not only the 2018 Final Rule, but also impacted the subsequent MIPS performance years (including 2019) regarding MIPS Eligibility and application of Payment Adjustment. OPTION TO OPT-IN : In 2019, the eligible clinicians who meet or exceed at least one of the three above-mentioned thresholds, will have the option to participate in MIPS if they choose to. If they do participate in MIPS, they will be subject to MIPS payment adjustment (positive, neutral, or negative). The clinicians who fail to exceed even one LVT criteria, will be excluded from MIPS and will not be able to opt in. The Bipartisan Budget Act has also changed the application of MIPS payment adjustments beginning with 2019, the first payment year of MIPS. The payment adjustments will apply only to the Medicare covered professional services listed under the Physician Fee Schedule, and not to all items and services under Medicare Part B. The Bipartisan Budget Act allows for flexibility in establishing the performance threshold for three more years (MIPS years 3, 4, and 5) to ensure a gradual transition to year 6 when the performance threshold would be based on the mean or median of final scores from a previous performance period. The proposed performance threshold for 2019 is 30 points. Flexibility in the weighting of the Cost performance category was another major impact of the Bipartisan Budget Act. Instead of requiring Cost category to to be weighted at 30% in 2019 (MIPS year 3), as per the Act, it has to be between 10% to 30% for years 3-5 of the Quality Payment Program. Also, the Improvement Scoring Bonus for the Cost category will not be applied for 2018 and 2019 performance years. The 2019 proposed rule puts forth many significant changes to the Quality performance category. The Meaningful Measures Initiative has influenced the proposed changes in a big way. CMS is utilizing the feedback and attempting to simplify the terminology as well as the reporting requirements for MIPS year 3. In Part-II, we will discuss the proposed changes to the Quality category for the MIPS track in 2019. Stay tuned! MIPS 2019: Show Me The Money! 2015 Certified EHR in 2019: What’s the Deal?